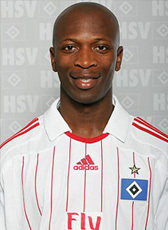 Romeo Castelen signed a 4-year contract for HSV in July 2007. Although suffering from many injuries during the four seasons, the club offered him a contract extension for another season until 2012 in June 2011. He was released from his contract after expiring in June 2012. In February 2013 he found himself a new club. Castelen joined the Russian Premier League for Volga Nizhny Novgorod until the end of the 2012-13 season. In July 2013 Castelen returned home and signed a 2-year contract at RKC Waalwijk after a succesful trial. In summer 2014 he went abroad again. He signed a contract in Australia at Western Sydney Wanderers until 2016. In summer 2016 Romeo Castelen moved to South Korean club Suwon Samsung Bluewings. In January 2017 he made another move in Asia. Castelen signed for Zhejiang Yiteng from the second tier in China. In January 2018 he was leaving China and returned home to help VVV Venlo in the Eredivisie.